Perfect location for my trip. Food, entertainment and strategic location. The young lady that checked me in was very friendly and helpful. Wish I got her name. I will later for my google review. I was made to feel welcome without a fake smile but a genuine happy face. Hallways could have been cleaner. Felt it could use a good vacuuming. Where to find Fairmont hotels near an airport? Where can I find hotels in Fairmont that are near tourist attractions? There are an extensive range of Expedia hotels to choose between when it's time to start organizing your trip to Fairmont. Expedia's network includes approximately 10 hotels within easy driving distance from the center of town. 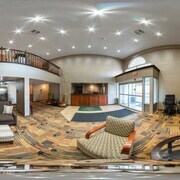 Fairmont's center is within walking distance of accommodation like Clarion Inn and The Inn at Pettyjohn. The Quality Inn is located 5 kilometres (3 miles) from downtown Fairmont and is the perfect choice for travelers on a budget. An alternative no-frills place to stay in this region is the Super 8 Fairmont. 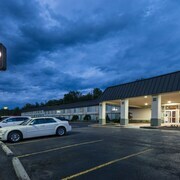 You could investigate the The Chestnut Boutique Hotel and also the Holiday Inn Express Morgantown. The The Chestnut Boutique Hotel can be found 25 kilometres (14 miles) away from the middle of Fairmont. 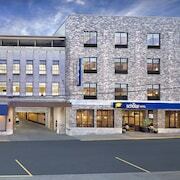 The Holiday Inn Express Morgantown, is located 30 kilometres (17 miles) away. 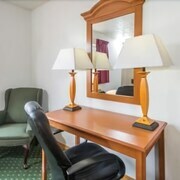 The Residence Inn by Marriott Morgantown as well as the Hilton Garden Inn Clarksburg are two other Expedia-listed accommodations in Fairmont. Why don't you see more of the mountains and rolling hills that are commonly found in in Northern Panhandle? Plan to spend a few days in some of the other parts of Northern Panhandle. You could travel to the region's places of interest or enjoy mountain climbing, hiking and horse riding and then find a comfortable place to stay the night. The closest accommodation options in Bridgeport are White Hall and Pleasant Valley. White Hall is 8 kilometres (5 miles) to the southwest of Fairmont, while Pleasant Valley is 4 kilometres (2 miles) to the south. 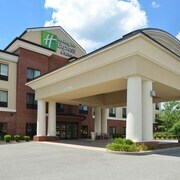 White Hall accommodations are the Holiday Inn Express and Suites Fairmont and Fairfield Inn & Suites by Marriott Fairmont. 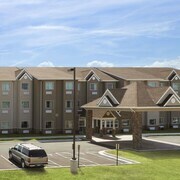 While apartments are the Red Roof Inn Fairmont and Microtel Inn & Suites By Wyndham Fairmont. Get your sports fix with a journey to Meadows Racetrack and Casino, which is 80 kilometres (51 miles) to the north of Fairmont. For visitors who are interested in staying nearby, make a reservation in the SpringHill Suites by Marriott Pittsburgh Washington or DoubleTree by Hilton Hotel Pittsburgh - Meadow Lands. If you are traveling into or out of North Central West Virginia Airport and choose to stay nearby try Holiday Inn Express & Suites Bridgeport or Wingate by Wyndham Bridgeport WV. What are the most popular Fairmont hotels? Are there hotels in other cities near Fairmont? What other types of accommodations are available in Fairmont? Explore Fairmont with Expedia.ca’s Travel Guides to find the best flights, cars, holiday packages and more!